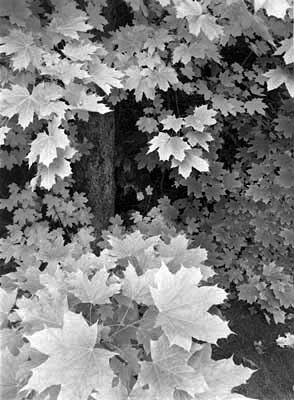 This photograph of cascading maple leaves with two, small leaves poking out in the middle may well turn out to be my most satisfying image. How they came to be was both an ordinary and extraordinary moment. After taking out the garbage can, I turned and saw beautiful light reflecting off these leaves that encroached on the back driveway. The shades in the leaves, which ranged from pure yellow to green with edges of off color, caught my eye. The swirling, stair-step arrangement naturally pulled my eye into the middle. There I found two small leaves huddled in the shadows. In some ways the image reminded me of earth's people - large and small of stature, upper class and lower class, younger and older (leaves with edges have beards, hehe). The two leaves shining out in the middle's darkness reminded me of me and my wife. I guess our son must be out with the rest of the leaves, as there wasn't a noticeable third leaf. Call it what you want - divine intervention, divine guidance or inspiration - the call to photograph can occur at any moment. "From my initial responses to nature came the desire to carry it in some form back to my house. After a time this led to the discovery of the weaving one can do with a photographic technique and then onto a process of soul searching. "I made the discovery that yes, I see things distinctly and differently from others in that I am so, and, so what? And on to the necessity of becoming simple and pure in my seeing and in my recording if I am to approach even the possibility of understanding. I must bring my activity to reverence - to love of work and to love of life. "Some of my pictures have always been a mystery to me in terms of how I arrived at them. Even with the technical ability to produce fine prints, I am hard put to know how it happens. Yet, unless technique and materials are seriously investigated and experienced, I see that moving statements are seldom made. The process of photography ever invites me. I hope never to lose this feeling. "At times I make photographs for the sheer magic of its process and the good feeling about the very stuff needed: light, chemical combinations, some imperceptible forces at work behind the scene. I am intrigued with it always. I am a part of the drama which takes the guise of photography." As an indicator that good things don't last forever, my neighbor cut down the maple tree the next spring. There are no leaves to greet me any more. Only my photograph reminds me of the leaves' insightful gift.